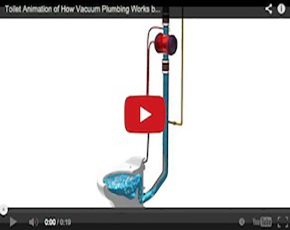 Vacuum plumbing systems are simple and viable alternatives to underground piping that uses the combined energies of vacuum pressure and gravity for the collection, conveyance and disposal of waste through a piping network that can be routed above ground. Vacuum drainage operates on the principal of having a majority of the plumbing system under a continuous vacuum. Hundreds of vacuum drainage systems are in operation around the world and are accepted by most code authorities. Vacuum systems are a viable drainage solution as noted in the latest edition of the IPC and UPC Codes. In addition, many local and state plumbing codes have also accepted vacuum plumbing as an approved alternative for a variety of waste types including condensate, grey water, sanitary waste and grease waste. A typical vacuum system can reduce potable water consumption for toilets by 68 percent with a highly efficient vacuum flush toilet requiring only a half gallon per flush. Of the many benefits vacuum plumbing offers, the water and waste treatment savings are one of the most important features of this technology. The water savings can be thousands of dollars and millions of gallons per year for larger applications. A 500 person commercial office building that is serviced by a single vacuum center and 1/2 gallon per flush vacuum toilets will save over 265,000 gallons per year, compared to conventional low flush toilets. While a vacuum plumbing system can be used on virtually any project, certain design and construction conditions may make it the most cost effective solution available.